Cordless Cellular Shades. Honeycomb Shades. Cellular Blinds. Bravo's Cellular Shades or Honeycomb shades feature excellent insulating properties while providing privacy, light diffusion and block 99% of damaging UV rays thus protecting your cherished upholstery,hardwood Floors and carpets. Bravo Cordless Cellular shades are one of the most popular window dressings. Blackout shades or Darkening shades provide the perfect environment for every bedroom in your home. Bravo is the best place to show for your cellular honeycomb shades or any cellular blinds! Bravo Cellular Shades or Honeycomb shades have a unique construction that provides style, privacy and protection for and door in your home or office. Cellular Door Shades these can fit on any door glass. Can be opened from Top or Bottom up. Wide array of colours and styles for any decor. Black out shades or darkening shades available. 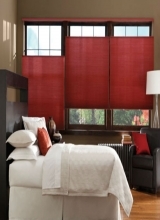 These shades uses 3/8" cell fabrics Translucent or Black out fabric. 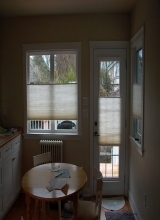 Bravo Cellular blinds are a beautiful accent to any home or office. Bravo Blinds is a leading manufacturer, producer and seller of the finest window treatments available in the market place today. Our selection of fabrics, design and technology in operating systems is second to none. We believe that you will see the Bravo difference once you have tried our products. We believe truly seeing is believing. Our products are designed to beautify and enhance your living space, that is bringing out the best your room has to offer. As well as to provide the most energy efficient products for your home. Many of our products have light diffusing to blackout properties that allow you to control your home, office or living space's privacy and lightening conditions. At Bravo, we strive to produce products that are not only esthetically pleasing, but functional and practical. Thereby, providing you with the best products for your money. Also at Bravo, we know that you desire to make your home, office or living space a reflection of you that is why we have a wide selection of fabrics, patterns and prints that will suit your style and match the elegance and your existing decor. If you are desiring to update the look of your existing space or design a whole new one, we would encourage you to contact us at Bravo blinds to show you the endless possiblities that you have to work with. At Bravo blinds, we are here to help you to discover your dream decor with beautiful and stylish products to finish and enhance your rooms, all at an affordable price!